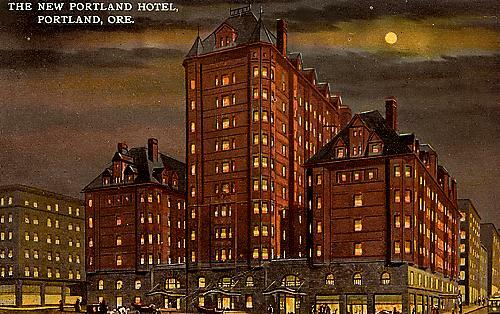 With seven floors, the Hotel Portland was the pride of Portland. 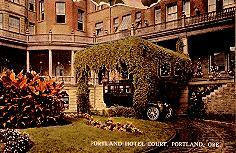 Built in the style of a Queen Anne Chateau, Portland’s most interesting and gracious building, the Hotel Portland, opened in 1890. This building captured the look and the feel of the city of Portland as no other building has before or since. In the early years, it was the place to see and be seen. It was conceived just as the nation went into a recession and money from eastern investors dried up. Financial problems led to construction delays, which plagued the Hotel until local financing was obtained. 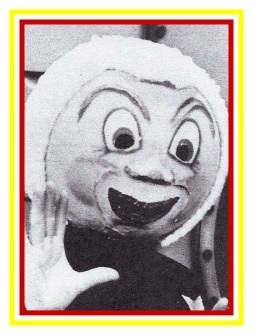 This would prove to be a problem in later years. 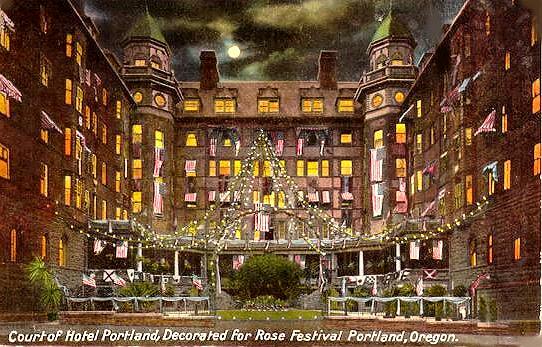 Nighttime view of the Courtyard decorated for the Rose Festival. The palm-lined Court of the Hotel Portland and Verandas. 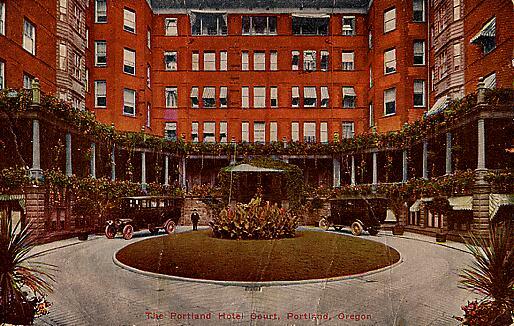 Wooden sidewalks encircled the block around the Hotel Portland. 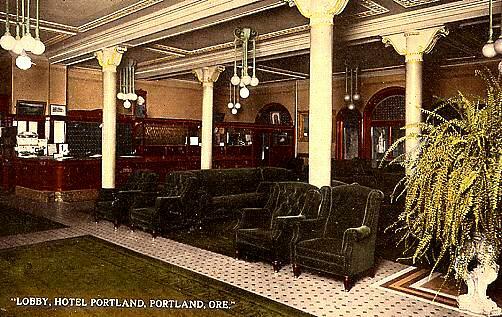 The stately Lobby of the Hotel Portland. 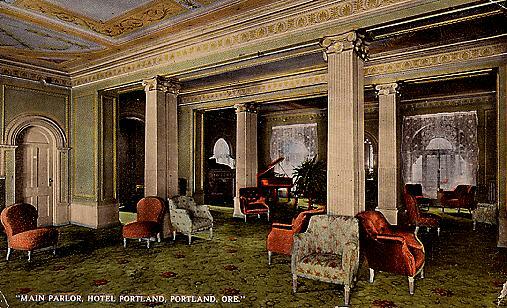 The Main Parlor awaited guests at the Hotel Portland. 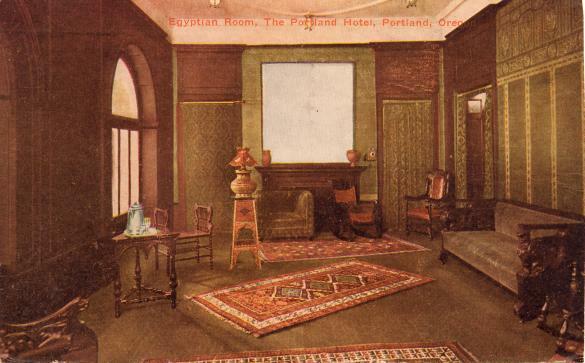 The ornately furnished Egyptian Room at the Hotel Portland. 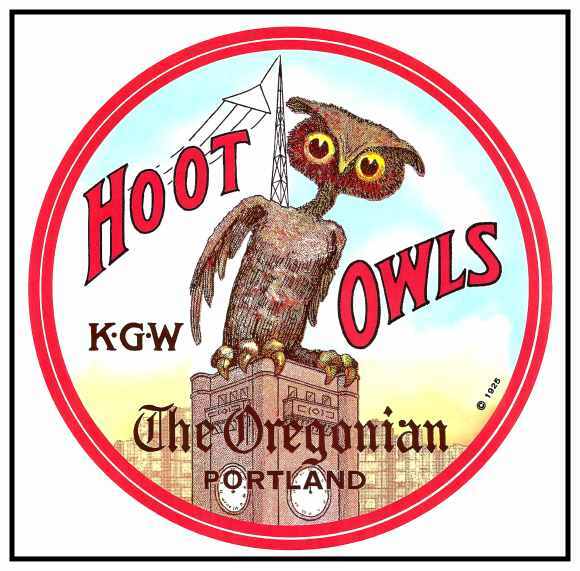 The service in the Main Dining Room, Portland’s finest, had the reputation of being the slowest and stateliest on the coast. 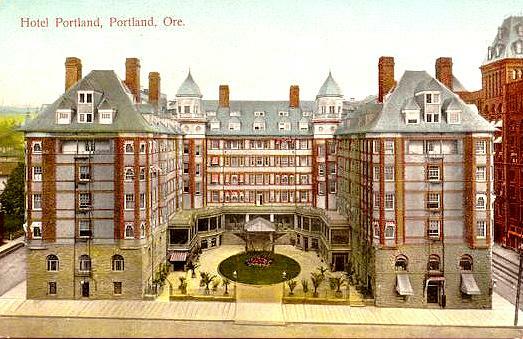 Eleven presidents stayed at the Hotel Portland and a set of Haviland China was purchased for each occasion. 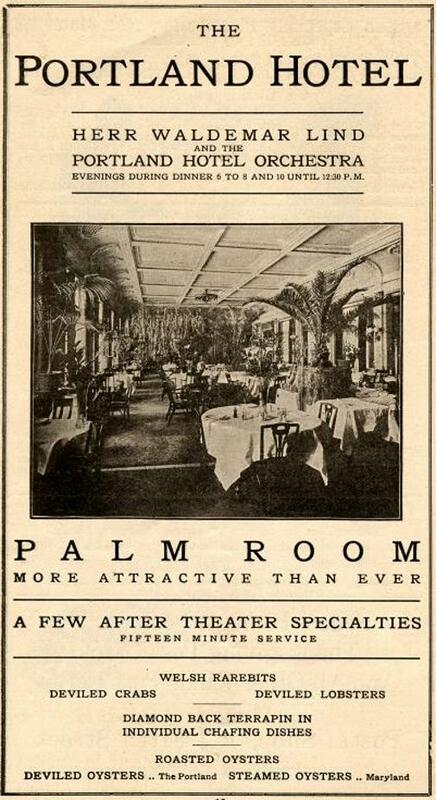 This ad appeared in a Theater Program from 1907. 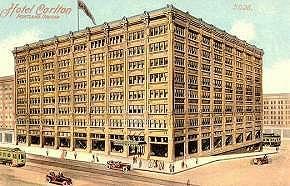 Around 1910, the Hotel floated expansion plans and went so far as to produce post cards with this artist’s rendition of what the Hotel would look like when the new 12-story section would be added in the middle. Many years later, the poorly constructed foundations began to deteriorate, causing the building to become run-down. 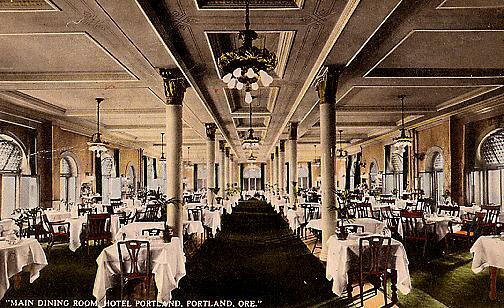 Eventually, the luster of the Hotel Portland was lost forever. 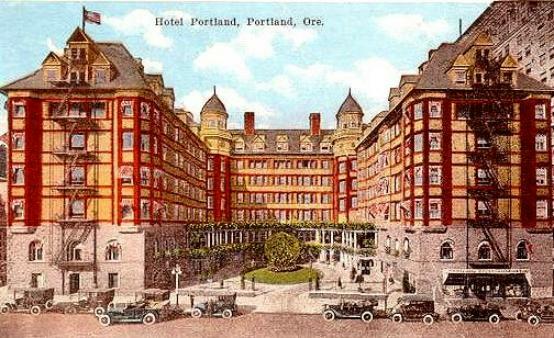 Shuttered in 1950, the Hotel Portland met the wrecking ball of “progress” on a quiet autumn day in 1951. After it was razed, a parking lot for Meier & Frank was built in its place. The two-level concrete parking lot was demolished 30 years later when Pioneer Courthouse Square recaptured the magic of the block, becoming the heart of the city. Once again thousands of people are drawn to the block daily.